Good morning darlings! 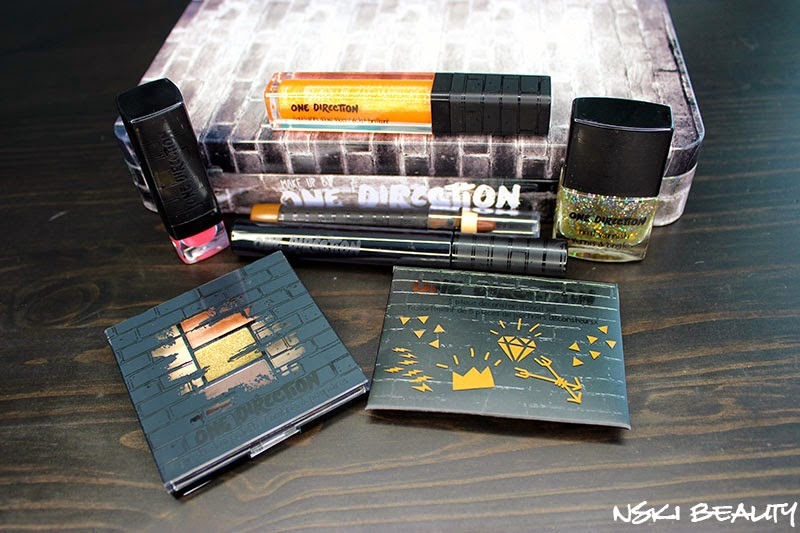 I recently had a chance to check out one of One Direction's limited edition collectible makeup tins. I was sent the Take Me Home Collection. 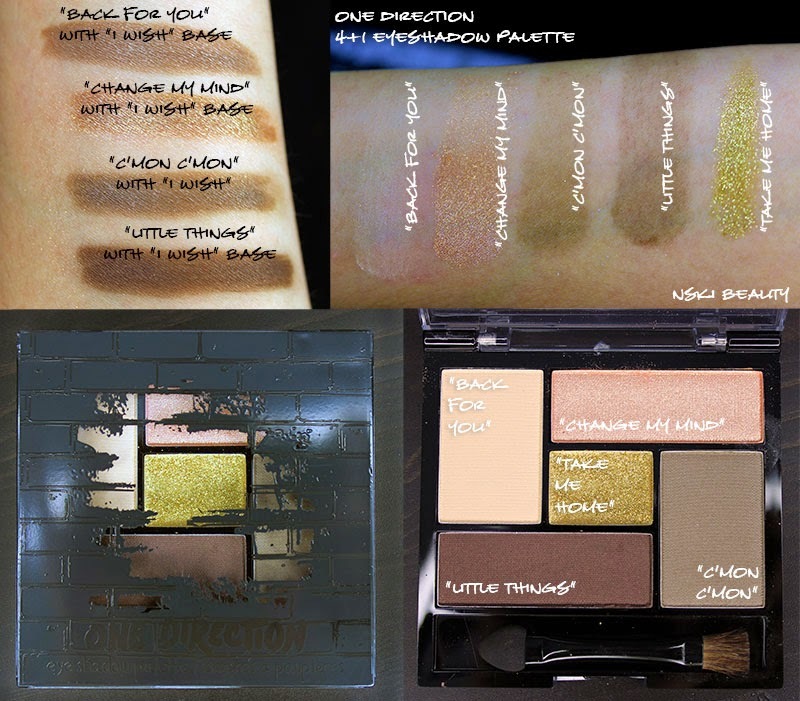 While I can't say I am a "One Directioner" I do like some of their songs and my curious was definitely peaked hearing a makeup collection was being made. A range of makeup and cosmetic products celebrating youth, style, and the uninhibited lifestyle of a new generation. Celebrating life with bold shades, unique formula and infused with limited edition collectible packaging, Makeup from One Direction is fun, bold, often irreverent, with a touch of cheeky mischievousness. Offered at prices that every girl and woman can afford. 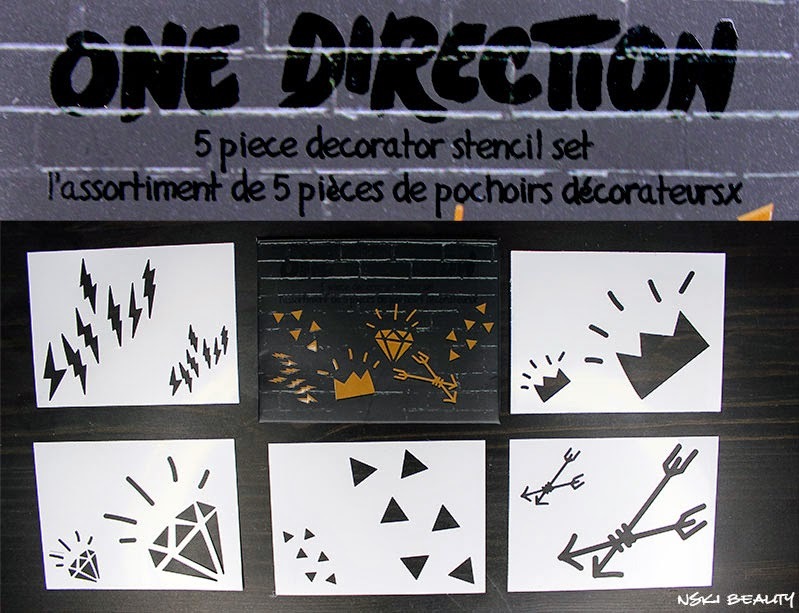 “The Looks Collection” comprises three keepsake tins inspired by One Direction’s globe-conquering albums, “Up All Night, “Take Me Home” and the latest chart topper, ‘Midnight Memories.” Each tin comes complete with everything you need to show off your personality. Are you a rock n’ roll girl, a fun party girl or the girl next door? We have just the right collection for you and illustrations to help show you just how to get your perfect look. 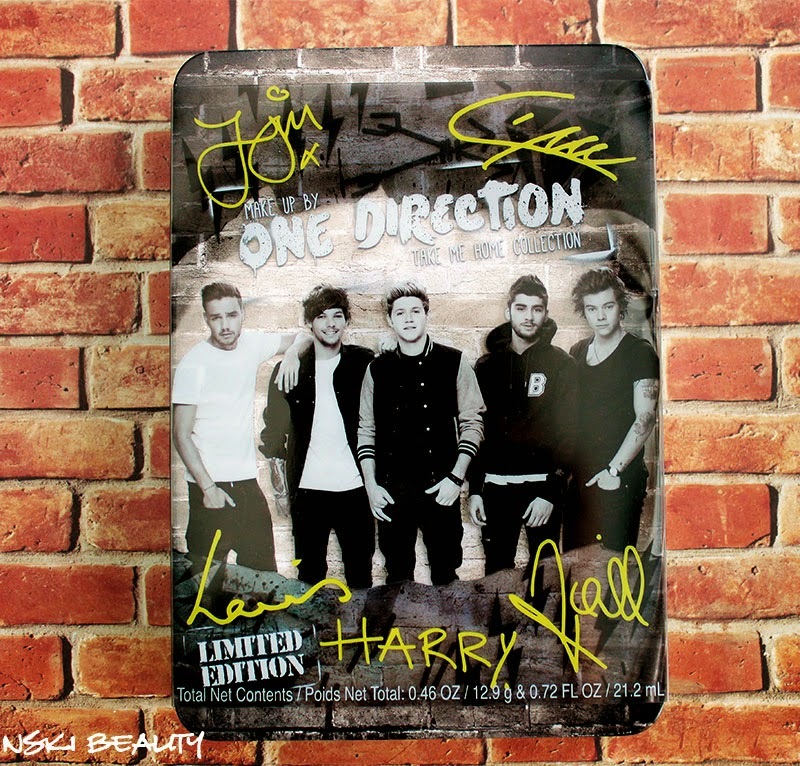 All your beauty essentials are housed in a LIMITED EDITION collectible keepsake tin with removable sleeve, complete with ONE DIRECTION doodle stencils to decorate your keepsake tin and make it uniquely your own! The makeup is housed in a tin and even offers three different makeup looks to try out with your tin. Starting off you have to keep in mind this collection is geared for young girls. While I can see grown women trying the collection out (ahem me for example LOL) it isn't the quality I am use to. Not that the product isn't great but I don't feel this would be something my age would reach for but more something I would get my younger cousins or friend's daughters. My overall impression of the collection was some what disappointed as a lot of the products were a bit messy. The lipstick was smashed/stuck to the lid and I had to wiggle it out to get it back into its tube and the eye shadow / body crayon also had product smeared inside the lid. However, that aside I was not completely disappointed. My favorite product out of the kit was definitely the mascara, I loved how it gave me a natural look but gave me length and kept my lashes separated. The liquidlights glow glass was extremely glittery but glided on very smooth. The orange color makes for a fun gloss color and didn't feel gritty like some glitter glosses can do. With the eye shadow palette while it contained GORGEOUS colors wasn't very pigmented unless used with the eye shadow crayon. Using the eye shadow crayon with the eye shadows allowed for pigmentation but because the crayon was so dark it really over powered the shadow but it did go on smooth and pigmented. However you could use a lighter base and the colors of the shadows would be great. Last First Kiss at first was a bit of a pain because it was stuck to the lid but after I was able to dislodge it and clean up the tube made up for the trouble with its creamy formula. The color is perfect for any age and wasn't drying. 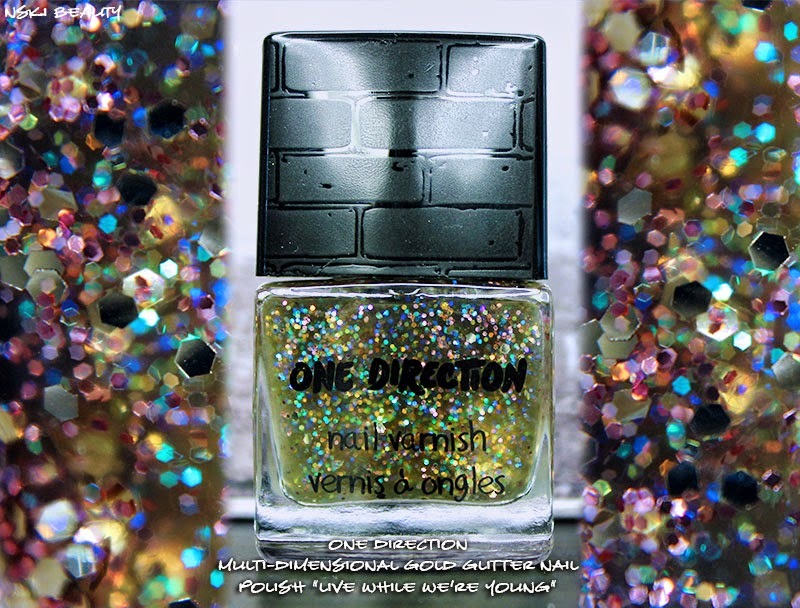 As for the Live While We're Young nail polish it is packed with tons of varying size glitter flecks but isn't an opaque polish. This polish is definitely more suited for a finishing additive to your polish. Over all this collection reminded me of what Wet n' Wild was when I was a kid. And while it might not be the best makeup it also made for great memories of growing up and being able to experiment with makeup. For more info head over to Makeup By One Direction's Facebook Page. Disclosure: Compensation was provided by Markwins International via Brandbacker. The opinions expressed herein are those of the author and are not indicative of the opinions or positions of Markwins International. I really like the eyeshadow colors! I also like that they show you how to put a few looks together, too. It does look a little youngish. I had to google One Direction. Does that make me REALLY old? The eyeshadow colors look gorgeous, but I just had a feeling that this would be lacking a little bit of what I would look for when it comes to makeup. This would be great for teenagers though!! Great review, I'm glad I finally got a look at the collection. I do love the vibrant colors but I wonder about the quality? This brand makes wet n wild AND physicians formula, so it's a tough sell for me. Great review!!! 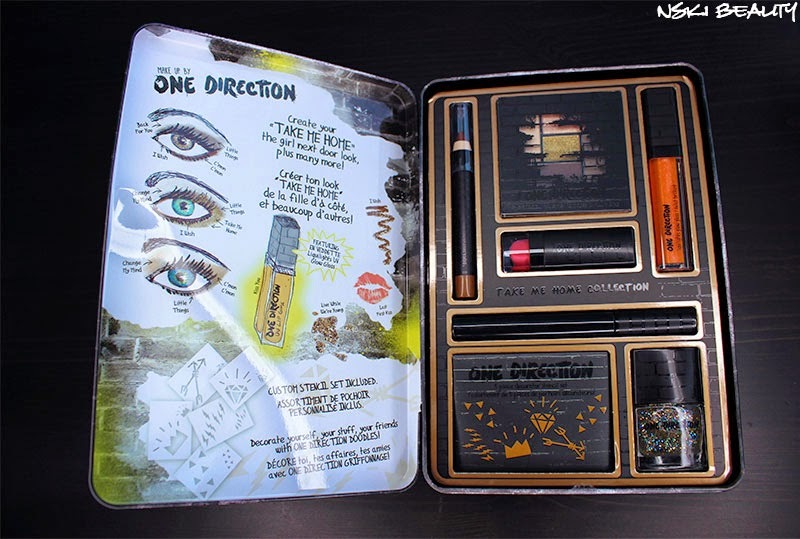 I definitely think that this makeup is definitely aimed at younger girls (teens) because that's where 1D's largest fan base lies! For what it's worth, it seems like an okay brand, but I wouldn't spend any money on it! 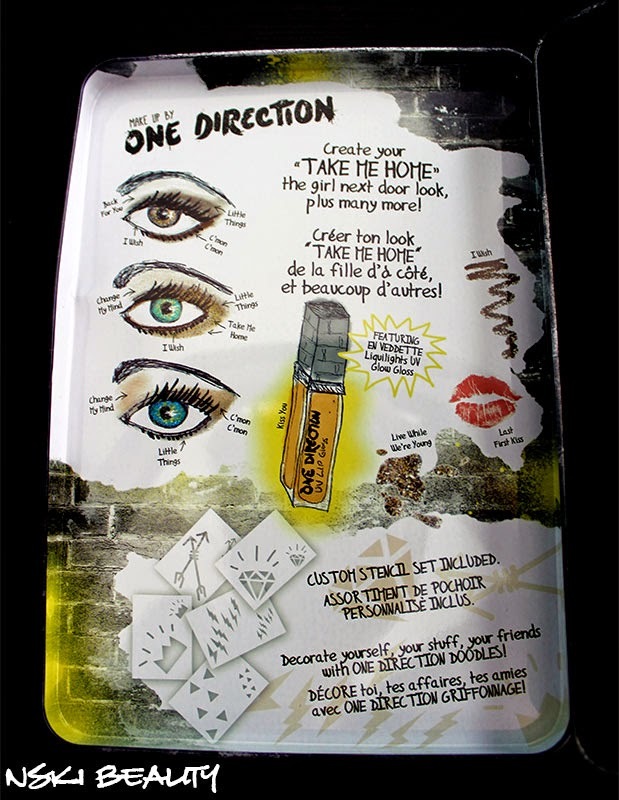 It's so funny that there is a makeup collection from One Direction, but I do like the collection itself. Very cool colors. And also I really like your review.